Heavy D (RIP) & The Boyz put Money earnin’ Mt. Vernon (NY) on the map in the mid eighties. Due to his squeaky clean image and danceable songs Heavy and crew were able to gain quite a bit of commercial success. Hev and Pete Rock were cousins, and like any good cousin who has a cousin that wants to get on, Hev gave Peter a chance and let him produce a joint on his second LP Big Tyme . The song “Gyrlz, They Love Me”, was released as a single and became a mild hit for Hev. Pete Rock would eventually become one of the original three members of Hev’s deejay, Eddie F’s production team The Untouchables. Rock eventually hooked up with a young up and coming emcee known to the world as C.L. Smooth, and the two would eventually parley the relationship Rock had with Hev and Eddie F into a deal with Elektra releasing a 6 song EP All Souled Out in 1991, and the rest is history. Pete Rock & C.L. Smooth would only release two full length albums after this EP before disbanding in 1994. I still wonder how many classic records the hip-hop world was cheated out of because of this break up. Good Life – The opening track finds C.L. addressing the pursuit of what most people dream about. PR’s drums aren’t as thick as what we would become accustom to hearing from him, but it still works. Nice start to the evening’s proceedings. Mecca & The Soul Brother – This is also the title song on their full-length debut album. I never cared much for the album version, but the EP version’s instrumental is buttermilk biscuit material. PR brings his jazzy horns mixed with what sounds like a harp over his trademark heavy drums, as C.L. smoothly dismantled this slick instrumental. Go With The Flow – Pete Rock provides the perfect drum beat that doesn’t distract the listener from focusing on C.L. Smooth. C.L. doesn’t waste the opportunity as he goes bananas on this one. Pete Rock adds a butter flute sample during the hook that works as a nice dessert in between C.L.’s verses. 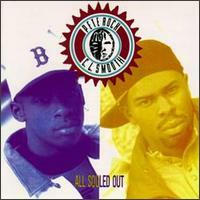 The Creator – Pete Rock’s solo joint. I can’t tell if Grand Puba or Heavy D penned his rhymes for this one. It doesn’t matter because his instrumental is so infectious you’ll forget someone is even rhyming over it. One of my favorite Pete Rock instrumentals in his very sizable catalog. All Souled Out – Compared to the previous 4 songs this title track is a slight step backwards. Not a terrible joint, just not as potent as the previous 4 songs. Good Life (Group Home Mix) – On this mix Pete Rock incorporates a sick organ sample during the verses that puts an interesting twist on the original. I prefer the original mix due to it’s crisp and cleaner sound, but this mx was not bad by any means. All Souled Out is the perfect appetizer, giving the listener just enough to see what the dynamic duo are capable of, but not enough to completely satisfy the hunger, leaving their mouths watering in anticipation for more, which would wind up being quite the wait since Mecca & The Soul Brother would not drop until a year later. Sometimes less is more as its hard to find anything to complain about on this 6 track jewel, marking the beginning of one of the greatest hip-hop duos of all time. A great time for hip hop. Mecca and the Soul Brother is my favorite song by these guys.